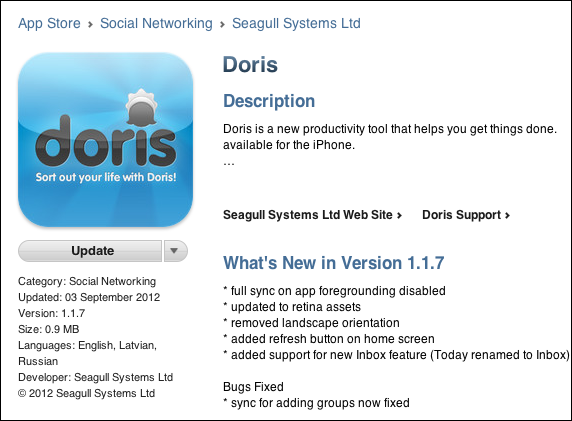 A long overdue update for the Doris iPhone app is now available in the appstore. This update includes partial support for the new features recently introduced in the Mac version of the app. Also the graphics are now retina ready. 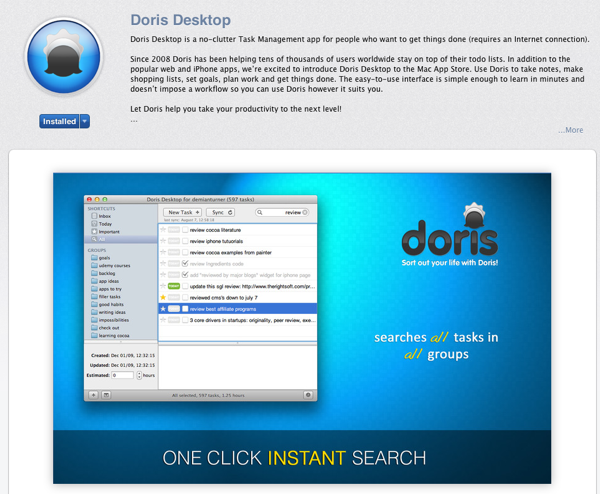 After 17 days in review the latest version of Doris Desktop finally went live a few days ago in the Mac AppStore. 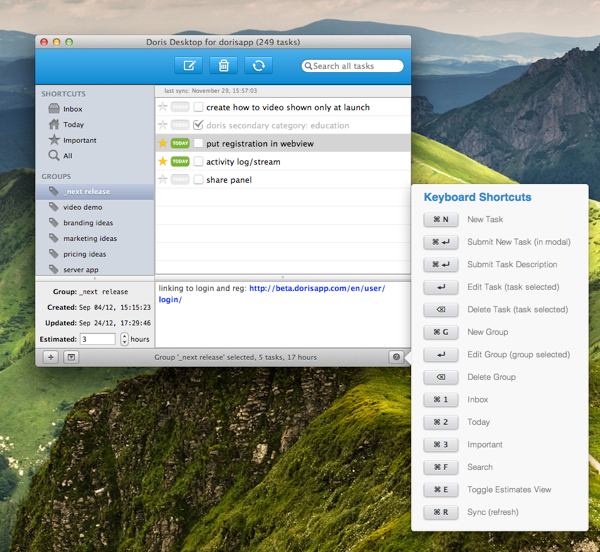 Check out the web page for a full list of features, screenshots and keyboard shortcuts. The new version of Doris has many improvements over its predecessor (which has now been discontinued). 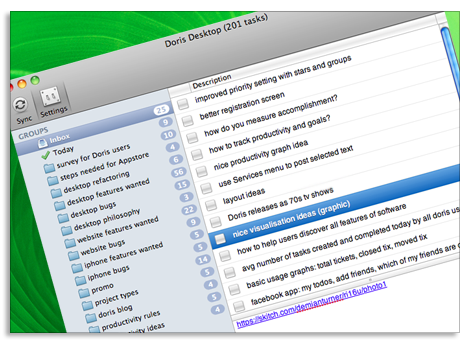 This Mac version of Doris remains the best way to manage your tasks, todos and notes and the iPhone app is currently being updated to bring it up to speed, a new release will be available in the next few weeks. as well as many bug fixes and UI improvements. More features are planned and the next release is already under development. Using the Mac appstore means you get notified as soon as improvements are available, and have the convenience of 1-click upgrades. The problem has now been fixed. We also fixed an issue that was affecting some users where the task count per group wasn’t working properly. Please let me know if you discover any other issues. 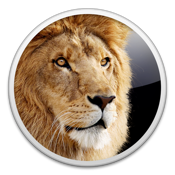 By the way, we’ve going to be making some changes to the database in the next few days to get ready to the new release of Doris Desktop on the Mac App Store. The planned outage will be advertised on the site and most likely very short. 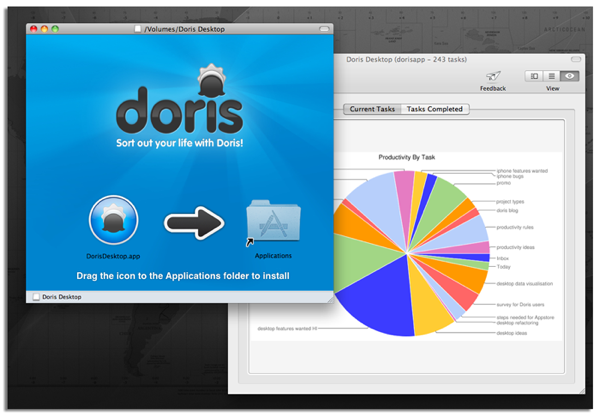 Doris Desktop 1.9 is now ready to download. A small fix was required to make it Lion compatible. 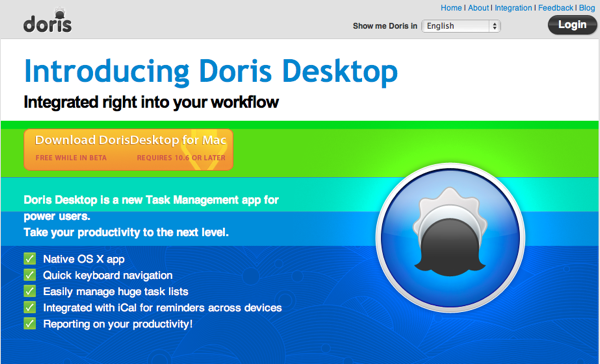 Doris Desktop 1.8 is now ready to download from the new, dedicated website. Data detectors enabled, effectively this means we have iCal integration! This latest version fixes a lot of usability bugs and is recommended for all users. This will be the last update before I introduce the new multiple view layout that will make a History view possible and some other nice surprises. For this last item, if you have a folder called Today (it’s not mandatory) you’ll get a nice checkmark icon for it. And if you name one of your groups Inbox you’ll get the appropriate icon.